Software engineers and others in the tech community like to speculate that the world we live in is somehow similar to the sort of CGI simulations that appear in 3D game environments. 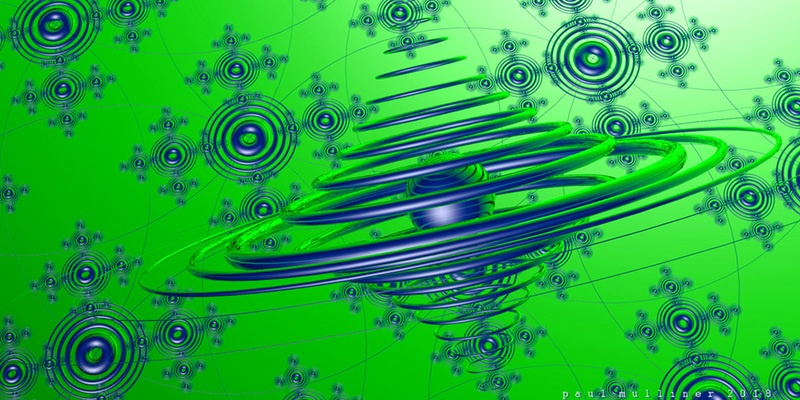 However, rather than being generated in realtime by software algorithms, the world is actually being generated in realtime by the transformation of a field of cosmic intelligence-energy into the quantum-scale vibrational standing-waves that we observe as the atoms and molecules of our world. The latest picture from science is that complex bio-molecules in human body cells can be regarded as clusters of three dimensional resonance-forms or standing waves in the fabric of a cosmic energy field. Cosmic intelligence is orchestrating the vibrational alteration of itself into the streaming flows of continuously emergent, quantum energy field-wave-patterns which we perceive as the cell biochemistry of living beings. Conscious awareness or consciousness is an intrinsic attribute of this cosmic intelligence field in all space everywhere. This insight into the nature of our world is available to all of us if we simply pay attention to the spatial conscious awareness we can know intuitively inside ourselves. This conscious awareness or consciousness seems to exist inside us, in a conscious space seemingly located somewhere inside our head. If we pay more attention to this conscious space however, we can become aware that it isn’t just inside us but also seems to be everywhere, inside and around everyone. Consciousness, the capacity for conscious awareness, seems to be in all space inside and around everyone, a cosmic field within all of us and throughout the Universe. When we focus our attention inwardly, we can begin to know intuitively that the spatial awareness within us is a cosmic field-consciousness in all space in the Universe, gazing into the world through all of us everywhere. This consciousness field-organism is the ‘I am’ inside all of us simultaneously, the experiencing and knowing which exists before, during and after the life of our unique human body. In a streaming flow of continuous emergence, one large conscious-intelligence field-organism is expressing and experiencing itself as all living beings everywhere in the Universe and knows each one of us as an expression of itself. When we take a focus of attention inward and pay attention to this living cosmic intelligence-organism, we can realise intuitively that it’s dynamically altering the energy fabric of itself so as to continuously generate in realtime the streaming flows of human body cell biochemistry that are essential for each one of us to exist as a living human being. Trillions of complex chemical reactions are occurring simultaneously throughout our human body, often requiring the precise participation of many different molecules which all have to be in the right place at the right time. This coherence and exquisite dynamic orderedness of cell biochemistry seems to reveal that an intelligent orchestrating influence is organising and arranging the bio-molecules that are continuously coming into existence inside a cell. Cosmic intelligence seems to be generating, orchestrating and synchronising the several trillion complex chemical reactions occurring simultaneously throughout the human body every moment. As it vibrationally changes cosmic energy into clusters of quantum scale standing waves, cosmic intelligence is orchestrating the streaming flows of coherent body cell chemistry that keep us alive. A conscious intelligence-field organism is vibrationally transforming cosmic energy into the living form of billions of unique humans and trillions of other life forms across the Universe. Within this all-experiencing cosmic consciousness field-organism, anything known anywhere is also known instantaneously everywhere. Our deepest self is the same self in everyone, everywhere at the same moment and our deepest consciousness is cosmic, not personal and nonlocal rather than local. Every part of the whole field continuously adjusts to changes in every other part of the field as cosmic intelligence orchestrates a self-knowing dynamic-coherence throughout itself. Holding an inner focus of attention helps us be fully present within the dynamic unfoldingness of now and find an intelligent engagement with the continuously emergent present moment. As a consequence, we’re more able to respond appropriately to circumstance. Becoming consciously aware of the spatial cosmic-intelligence organism helps us begin to place less attention on our thinking and lessen our tendency to separate ourselves from the world around us with our thoughts. Thinking and the apparently separate ego-self construct it generates within us are both of course essential to our life in the world, but too much thinking can monopolise our attention, taking it away from a dynamic focussed engagement with the continuously unfolding present. Although we may be more used to holding a focus of attention on things around us in the world such as words on a screen or the road ahead through the windscreen of a car, we can also take this focus of attention inward if we choose and pay attention inside ourself, to the ‘I am’ within us. Our inner-focussed attention reveals the cosmic self, the self in all of us everywhere simultaneously. This cosmic self is the intelligent, conscious presence we find inside ourselves when we pay attention to it. Intrinsically expressive of a nonlocal, all-experiencing conscious intelligence, this cosmic self is the same self in everyone, everywhere at the same moment. The cosmic field-consciousness inside all of us everywhere is where the knowing, seeing and experiencing of a human life happens. One large, transparent field-intelligence organism in all space in the Universe is generating us all out of itself and living and experiencing life as all of us everywhere. As we become conscious of its presence within ourselves we can begin to realise that it continuously knows and sees all of us that are born and die within it. Paul Mulliner is a writer and digital artist.